© VALENTYN OGIRENKO/Reuters National security adviser John Bolton speaks at a news conference in Kiev, Ukraine August 24, 2018. White House national security adviser John Bolton, a longtime opponent of the ICC, is expected to outline threats of sanctions and a ban on travel to the United States for people involved in the attempted prosecution of Americans before the international court in an address Monday. Bolton is expected to outline a new campaign to challenge the court’s legitimacy as it considers cases that could put the United States and close allies in jeopardy for the first time, according to individuals familiar with the planned remarks who spoke on the condition of anonymity because they were not authorized to do so on the record. One person said Bolton plans to use the speech to announce that the Trump administration will force the closure of the Palestine Liberation Organization’s office in Washington in a dispute over a Palestinian effort to seek prosecution of Israel through the ICC. 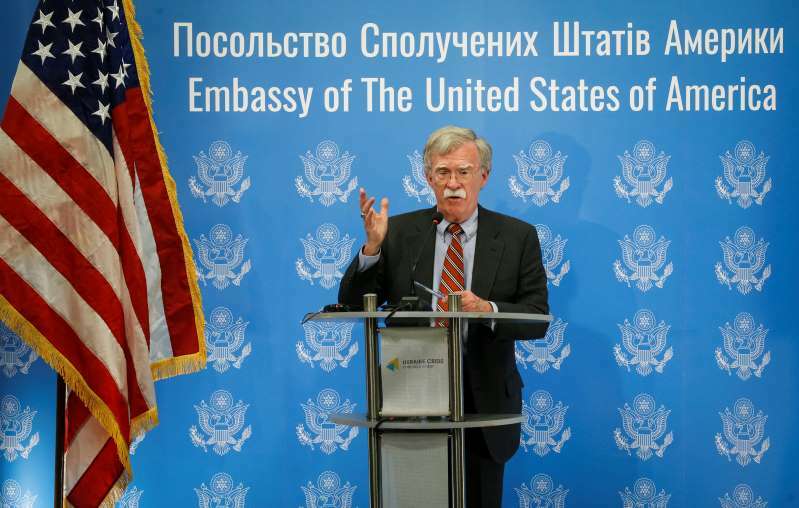 The ICC investigation of U.S. wartime actions represents exactly the kind of infringement on U.S. sovereignty that Bolton and other opponents of the court have long warned about, that official and others said. “It’s a much more real policy matter now because of the potential liability in Afghanistan,” the official said, adding that other nations share U.S. concerns. The new broadside against the ICC follows steps by the administration challenging international cooperation in other areas. This year, the administration has withdrawn from the United Nations human rights body, halted financial support for a U.N. aid program for Palestinian refugees and threatened to pull out of the World Trade Organization. Bolton’s speech comes two weeks before President Trump will attend the United Nations General Assembly, where he will address other world leaders. U.S. officials have said Trump will focus on U.S. claims about the threat posed by Iran, and reiterate his opposition to the international nuclear deal with Iran. Trump pulled the United States out of the deal in May. The United States has never signed the 2002 international treaty, called the Rome Treaty, that established the court, which is based in The Hague. “It’s going to create friction that’s not necessary and it’s going to create the impression the United States is a bully and a hegemon,” said Pomper, who now is U.S. program director at the International Crisis Group. Bolton’s opposition has intensified as ICC judges evaluate a request from prosecutor Fatou Bensouda, who last fall asked for permission to formally investigate alleged crimes committed during the Afghan war. That could potentially include actions by U.S. military or intelligence personnel in the detention of terrorism suspects.